To review the implementation status of DRM digital radio broadcasting in India and to discuss the development of strategies for a faster roll out, Broadcast Engineering Consultants India Limited (BECIL) and the DRM Consortium and jointly conducted the 2nd DRM Round Table in New Delhi on 10th Oct 2018. While inaugurating the 1st DRM Round Table on 31st Jan 2017, Mr M Venkaiah Nadu, the then Hon’ble Cabinet Minister for Information and Broadcasting (now Vice President of India) said, “Digital Radio provided a unique opportunity for all the stakeholders, both public and private broadcasters, to carry forward the vision of Hon’ble Prime Minister to achieve Digital and Connectivity Revolution in the Country.” Accordingly, the theme of the event was “Digital Drives Forward – Achieving PM’s Dream of Digital India”. 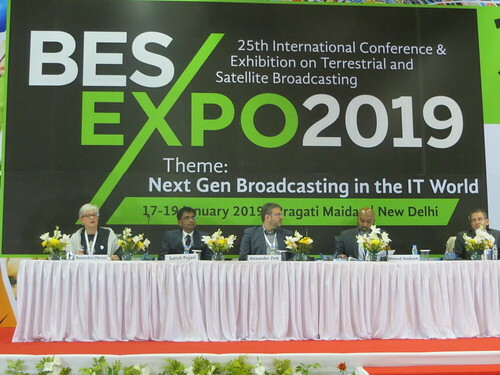 The 2018 event was very successful and was well attended by stakeholders from every part of the broadcast eco-system. 90 officials including the Additional Secretary Ministry of Information & Broadcasting; Engineer-in-Chief and other senior officers of All India Radio and Doordarshan; officers from Prasar Bharati, Wireless Planning & Coordination (WPC) Wing, National Highway Authority of India (NHAI) and BECIL; manufacturers/designers of Mobile Phones & DRM digital radios, automobiles & chips; Private Broadcasters; system integrators were present. Mr George Kuruvilla, CMD BECIL, welcomed the participants emphasising the importance of digital radio broadcasting in India. Ms Ruxandra Obreja, DRM Chair, outlined the status of deployment of DRM in the world. She added that the Russian Federation had recently announced the intention to adopt DRM standard for digital radio broadcasting in VHF band II. She also mentioned that the Government of South Africa has invited comments on the recommended adaptation of DRM standard in MW and VHF bands I and II. Outlining the tremendous progress made in India in the last 18 months (after the first round table), Mr Yogendra Pal, Hon Chair of the DRM India Chapter, mentioned that 35 high power MW DRM transmitters of AIR (having total power of 7020 kW) are fully operational; 33 of these are operating in simulcast mode (28 transmitters in pure DRM also for one hour daily) and 2 in pure DRM; 5 transmitters are already broadcasting in xHE-AAC audio quality, with Journaline advanced text services and station logos; AIR has tested Emergency Warning Functionality (EWF) from both the Delhi DRM transmitters in association with National Disaster Management Authority (NDMA); instructions have been issued by AIR to mount public awareness campaign about DRM digital broadcasts; four successful meetings of the DRM Indian Stakeholders’ Group hosted by BECIL; Secretary (I&B) also had a stakeholders’ meeting on the TRAI recommendation of Digital Radio Broadcasting in India; over 10 lakh cars (one million) have line-fit DRM receivers; 3 Indian companies and a National Technical Institute are working in India for the development of standalone DRM receivers and BECIL is likely to take up shortly manufacturing of standalone DRM receivers. 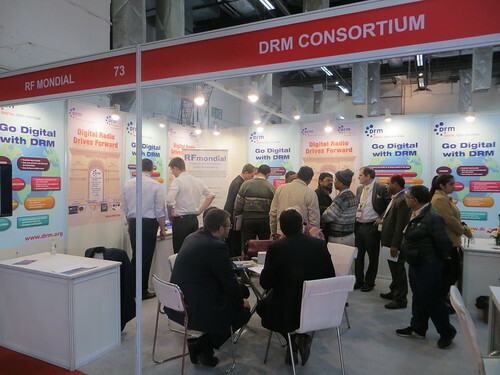 While outlining the features of EWF on DRM digital, Mr Yogendra Pal underscored its importance for India. 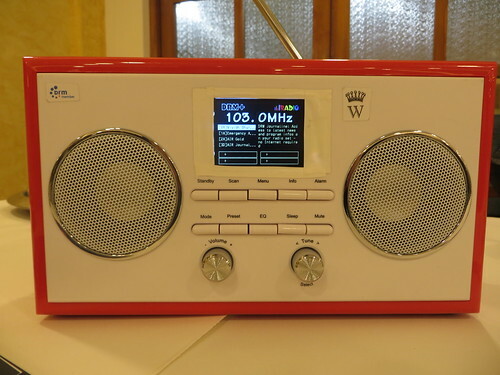 He said that radio listeners in disaster affected areas should not miss disaster signals, should get information in the languages of that region and be reached from remote locations (in case the local radio transmission network fails) while listeners outside the affected areas should continue to enjoy normal radio transmissions, even when the emergency signals are on air. Mr Alexander Zink from Fraunhofer IIS made a much-awaited presentation on ‘What Private Broadcasters can transmit within 200 kHz bandwidth in Digital?’ He said that in addition to up to 6 high quality audio channels and a host of other value-added services, the area covered by a FM transmitter can be served with just 10% power in DRM digital thereby giving a huge saving in initial set up as well as recurring costs on electricity, operation and maintenance. 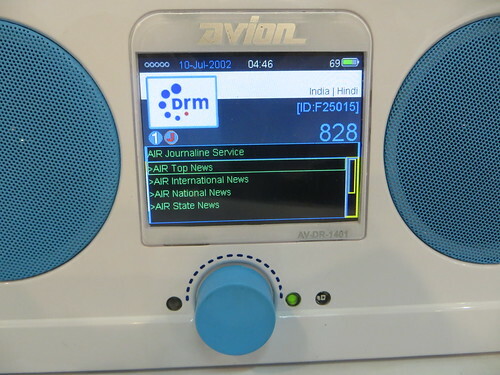 DRM’s advanced text service Journaline provides new revenue sources for broadcasters, with convenient ad placement, detailed listener targeting and hot-button interactivity through a separate back-channel on connected devices. 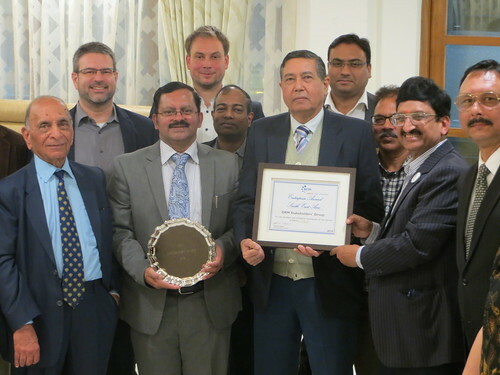 Mr Ankit Agrawal from AVION Electronics; Mr Dilip Divekar from NXP; Dr Venkataramani and Dr Bhaskar from NIT Trichy; Mr Rajith Nair from Inntot; Mr Johannes von Weysenhoff from Starwaves; Mr Vijaya Bhaskar from Tata Motors and Mr Alexander Zink from Fraunhofer IIS outlined activities carried out by their organisations in the development of DRM digital receivers. Representatives from Geek Synergy, Gospell and Titus could not be present but presentations on their behalf were made by Mr Alexander Zink. 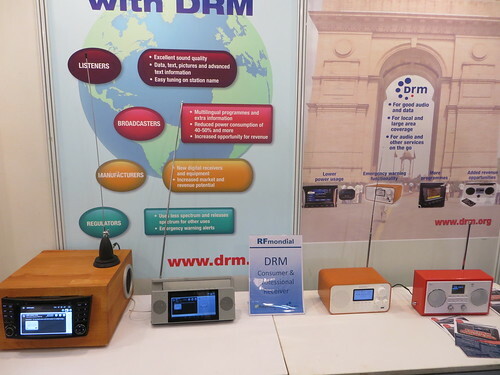 DRM standalone receivers and automobile units being produced and/or being developed were displayed by Inntot Technologies, Avion Electronics, Starwaves GmbH, Fraunhofer IIS, Gospell and Titus. 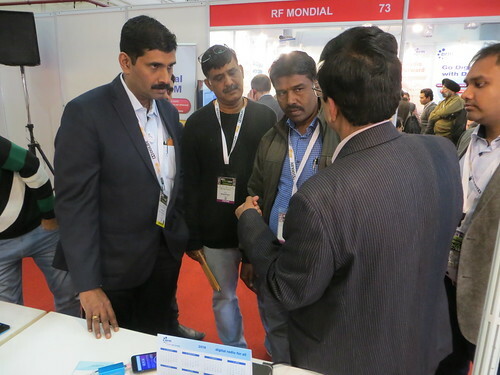 Inntot Technologies and Fraunhofer IIS also demonstrated the live reception of DRM signals in VHF Band II (FM band) in smartphones and standalone receivers. 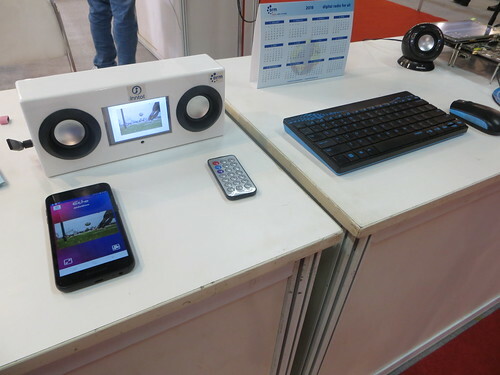 The Hyundai Tucson model, which has line-fit DRM receiver, was on display during the event. 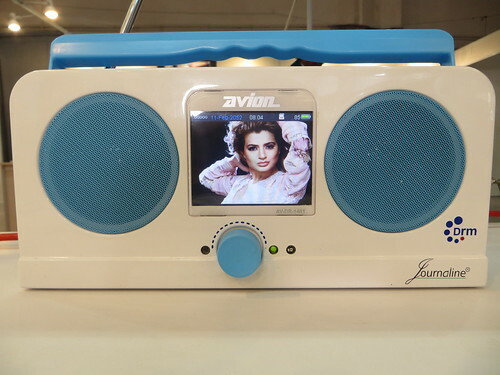 Participants listened to the very good DRM quality sound of ‘AIR Gold Delhi’ channel and saw DRM text messages (‘scrolling text’) on the radio screen in the car, coming from AIR’s medium Wave transmitter in Delhi. 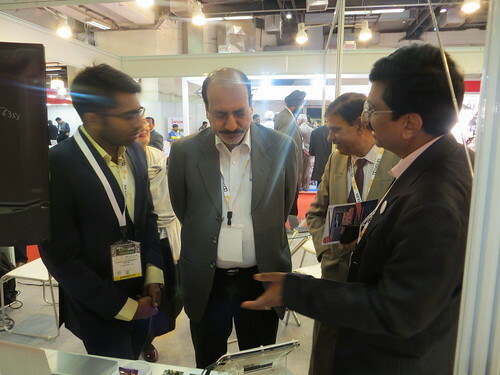 Participants witnessed the live reception of DRM features and took keen interest in their possibilities. They asked a lot of questions and made suggestions: AIR should provide attractive and exclusive content on DRM with value added services including Emergency Warnings; a research team should suggest what content should be broadcast by AIR in DRM digital;; pure DRM must be broadcast during peak travel times in the morning and evening and duration of pure DRM must be increased;; as recommended by TRAI, Government should announce a roadmap for digital radio broadcasting in VHF Band II (FM Band) by private broadcasters; AIR should announce a similar plan so that the industry (cell phone, automobile and standalone receiver manufacturers) can consider its increased involvement and support; Government must offer incentives to private broadcasters so that they go for digital radio transmissions in VHF band and share the AIR MW digital network.